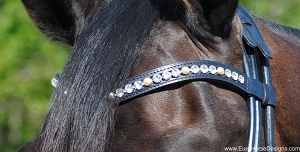 Don't settle for just any crystal browband, at Euro Horse Designs, you can customize your own high end bling, to suit your taste and style. Made by hand, Otto Schumacher uses only the best European bridle leather and Swarovski Crystallized Elements™ for their browbands. Choose from a wide variety of crystal and pearl colors for that extra sparkle that will turn heads everywhere.